Chili, or chili con carne, with its Texas origins and widespread popularity, is an excellent choice for a fall or winter meal, and it makes a fabulous main dish offering for large gatherings and parties. Many Texans will be quick to tell you it's not chili if it has beans, so you might want to call it "chili with beans" if you add them. Who invented chili? There are several theories. E. De Grolyer, a scholar and chili expert, believed it had its origins as the "pemmican of the Southwest" in the late 1840s. According to De Grolyer, Texans pounded dried beef and beef fat, chile peppers, and salt to make trail food for the ride out to the gold fields and San Francisco. The dried mixture provided cooked meals along the trail, a sort of "instant" chili. A variation on the same theory is that cowboys invented chili when driving cattle. The cooks purportedly planted oregano, chiles, and onions among patches of mesquite to protect them from foraging cattle. The next time they passed the same trail, they would collect the spices, combine them with beef, and make a dish called "trail drive chili." The chile peppers used in the earliest dishes were probably chilipiquíns, which grow wild on bushes in some parts of South Texas. Probably the earliest mention of the dish, though not the name, according to Dave DeWitt and Nancy Gerlach in "The Whole Chile Pepper Book," was by J.C Clopper. He visited San Antonio in 1828 and commented on how poor people would cut the little meat they could afford "into a kind of hash with nearly as many pieces of pepper as there are pieces of meat - this is all stewed together." The first mention of the word "chile" was in a book by S. Compton Smith, "Chile Con Carne, or The Camp and the Field" (1857), and there was a San Antonio Chili Stand at the 1893 Chicago World's Fair. It was in 1902 that William Gebhardt, a German Immigrant in New Braunfels, Texas, created a "chili powder." His brand of chili powder helped to popularize the dish throughout the Southwest. It's still one of the most popular chili powders on the market. Chili con carne is a dish of well-seasoned and well-cooked beef with chile peppers. In New Mexico, chili is often more of a stew with chile peppers and vegetables, with or without meat. In California, chili is usually a mixture of ground beef and beans, different from any other Southwestern versions. Cincinnati chili, created in 1922 by a Macedonian immigrant named Athanas Kiradjieff, is another unique variation on the dish. Kiradjieff settled in Cincinnati and opened a hot dog stand called the Empress, where he created a chili with Middle Eastern spices. Served a variety of ways, his "five-way chili" was a concoction of a mound of cooked spaghetti topped with layers of chili, chopped onions, kidney beans, and shredded yellow cheese. On top of all that, the chili was served with oyster crackers, and a side order of hot dogs topped with shredded cheese! Chili might be served with rice or with beans on the side. Tortillas are an excellent bread to serve with chili, and cornbread, saltines, and oyster crackers are some other favorites. Make huge batches - chili freezes well! Fill your tortillas with leftover chili. Quick and Easy Ground Beef Chili With Beans If you want your chili fast, this is the perfect recipe. It's simple and versatile. Spicy Ground Beef and Pinto Bean Chili This is another excellent choice for the stovetop. 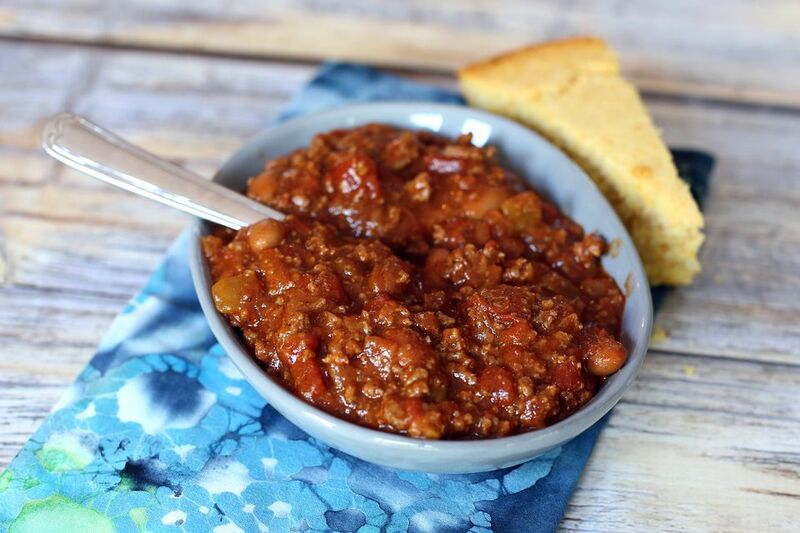 The chili is simmered to perfection with chile peppers, seasonings, and tomatoes. Ground Beef and Black Bean Chili Serve this chili as a main dish or use it to top hot dogs, tacos, or nachos.